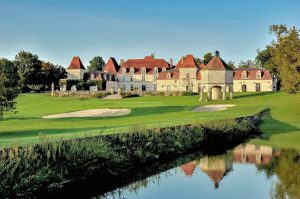 Chateau des Vigiers, the 27-hole golf resort in the heart of the Dordogne wine region of south-west France, now promises ‘visiting golfers’ an even better experience. With upgraded golf & leisure facilities, renovated bedrooms, and a sumptuous new wine cellar in the chateau’s Michelin Star restaurant, “Les Fresques”. Known as ‘Petit Versailles’, the resort’s 16th-century chateau forms an enchanting backdrop when you check into one of the hotel’s 65 four-star rooms. And if you’re a golfer you will find new-look changing rooms, a much more comprehensive pro shop and upgraded golf buggy tracks this season, as well as improved bunkers out on the golf course. For those looking for a more permanent ‘home away from home’ in beautiful south-west France, Chateau des Vigiers also now has five brand-new golf homes for sale overlooking the 7th and 8th greens, each individually-designed by French architect Didier Griffoul. The one, two and three-bedroom properties come complete with their own golf buggy, and give owners direct access both to 27 holes of French resort golf and to the estate’s many facilities, right on the doorstep. If you are seeking to relax as well as play golf, the newly-renovated Spa at Chateau des Vigiers will reopen in May 2018 with a new hydrotherapy pool. Three new treatment rooms and a new team of beauticians on hand with the 2018 range of Sothys Paris beauty products. “2018 is a significant year for golf in France, with the eyes of the world upon us when The Ryder Cup visits our country this September, and we are expecting to welcome record numbers of golfers to our wonderful facility.” said Niels Koetsier, Managing Director at Chateau des Vigiers. New shareholders took a controlling interest in Chateau des Vigiers in July 2017, and have already spent in excess of one million Euros on improvements. The resort is now under new management, headed by Niels Koetsier who took over as the resort’s new Managing Director, also in July 2017.